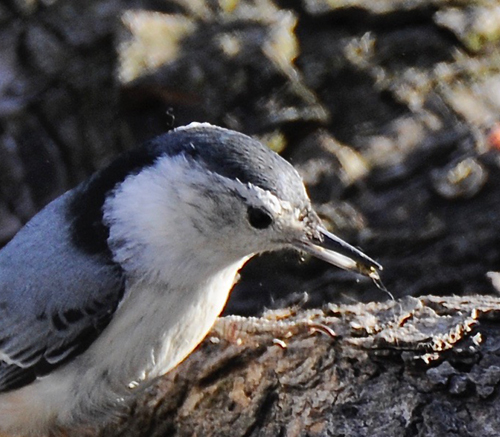 The White-breasted Nuthatch has an interesting way of defending its nest. It captures an insect with its bill, then swipes the crushed bug back and forth around its nest cavity. You can see the insect in the bill of this bird, one of a pair nesting in our yard. We have watched it do this several times in the past few days. The species monograph from the American Ornithologists’ Union says the bird also does this inside the cavity as well. The action is described as a possible chemical defense, a defense secretion of the insect smeared near the nest hole to deter predators or cavity competitors like squirrels.